If you are interested in which native and non-native plants grow wild in Lanark County, how common they are, and where they occur, you've come to the right site. 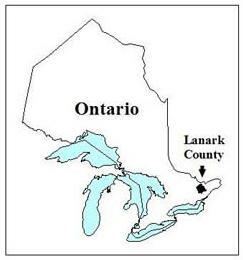 As the map at the lower right shows, Lanark County is found in southeastern Ontario (Canada). The 2016 revised edition of the Plants of Lanark County, Ontario is an annotated checklist which presents the 1309 taxa (species, subspecies, varieties, and hybrids) of native and non-native vascular plants known to occur in the county. Vascular plants are those which have vessels or ducts to transport fluids. Included are trees, shrubs, herbaceous flowering plants (annual and perennial), ferns, clubmosses, and horsetails, but not mosses, lichens, or algae. The 2016 update is a relatively minor revision of the previous (2013) edition. Eight new taxa (species and hybrids) have been added: Campanula trachelium —Nettle-leaved Bellflower; Euonymus alata—Winged Burning-bush; Isoetes septentrionalis—Northern Quillwort; Isoetes ×dodgei—Dodge's Quillwort; Mentha ×gentilis—Red Mint; Potamogeton ×faxonii—Hybrid Pondweed; Spiranthes magnicamporum—Great Plains Ladies'-tresses; and Staphylea trifolia—Bladdernut. Salix ×rubens—Hybrid Willow has been subsumed under Salix ×fragilis (following the Flora North America project) reducing the list count by one. There have been additional records of rare, sparse, and uncommon species, resulting in status designation changes for quite a few plants. Recently published volumes in the Flora North America project have necessitated a number of nomenclatural changes in Salicaceae, Brassicaceae, and Rosaceae. A section in the checklist on Significant Areas highlights 17 areas with exceptional plant diversity and rare plant concentrations. This section is also available on the Significant Areas page of the site. The Rare Plant Photos page shows a selection of photographs of plants that are considered rare in the county. This section is a work-in-progress and additional photos will be added during the field season. For each species on the checklist, scientific name, common name, and status within the county are given. Brief habitat notes are given for all rare, sparse, and uncommon plants. Locations are given for all rare and sparse species. For a non-native plant to be included on the list, it must have been found growing in the county without the aid of cultivation. Although there are a number of garden plants and agricultural crops on the list, all were found where they had spread on their own and were surviving untended. Since the complete plant list is rather long (100 pages), I am making it available as a PDF file which you can download (at no cost) from the Download Plant List page and view and print using Adobe Reader® which most internet users have. If you do not, this software can be downloaded (for free) from the Adobe website. If you're not sure whether an "annotated checklist" might be of interest, look at a Sample Page first. A county checklist can be a useful aid to plant identification when used along with floras and field guides that cover a larger geographical area. By highlighting significant native species (those classed as rare or sparse), the list should be a useful reference for environmental impact studies and natural area evaluations. It is hoped that making this list available will encourage the recording of new species, the reporting of additional records of rare and sparse plants, and the refining of the status designations. Such input and feedback will contribute to the New Records page and, eventually, to an updated version of the checklist. If you think you have a new species to add, an additional record of a rare or sparse plant, or any comments at all on the project, I hope to hear from you!